Member George Wilson introduces his photo presentation covering his recent 15 day African Safari Trip. He then provided a very entertaining and informative narrative to accompany the many photos. 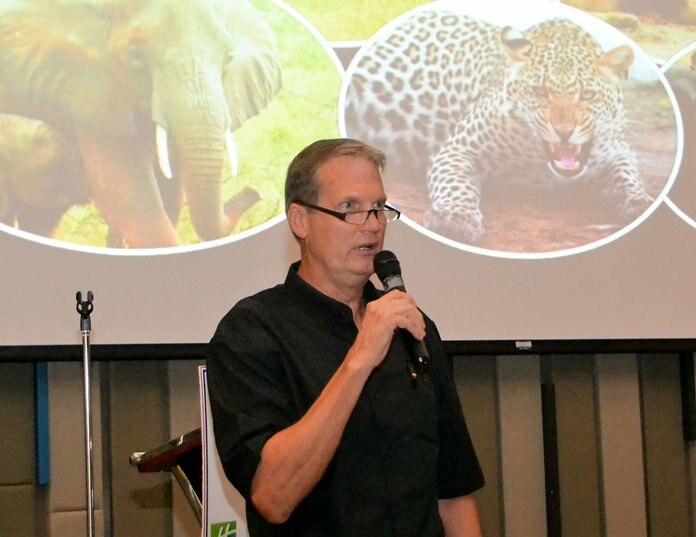 Club member George Wilson shared his experiences during a 15-day African Adventure with fellow members and guests of the Pattaya City Expats Club on June 18. Along with many photographs, he covered all or most of the stops from Suvarnabhumi Airport, Thailand, to Nairobi, Kenya, onward to Mt Kilimanjaro in Tanzania, Ngorongoro Crater, the Serengeti, Grumeti Hills, the Rift Valley and back to Thailand. George was accompanied on the trip by his adult daughter, Ashley. Their first day brought them to JRO Kilimanjaro International Airport in northern United Republic of Tanzania, located in South-Eastern Africa. George was impressed with the comfortable accommodations at the Moivaro Coffee Lodge, which is situated on a 40-acre coffee plantation just outside Arusha National Park. The following morning a driver-guide ushered them through a full-day visit to the nearby picturesque Arusha National Park, which is a very diverse area bounded by the foothills of a dormant volcano, a 12 mile (20 km) wide crater and the beautiful Momela lakes. This protected area is home to many of the large African mammals, including lions, tigers, leopards, elephants, hippos and rhinos. They stayed at the Olduvai Camp where they were taken by foot to Kopje to admire a sunset over the southern Serengeti planes, the “land of endless space”. Tarangire National Park and River was the next destination. The river provides a source of fresh water for wild animals during the dry season and supports the long-distance migration of wildebeest and zebras. The park is famous for having many elephants, giraffe, impalas, gazelles, vervet monkeys and olive baboons. It also has predators such as African lions, leopards, cheetahs, badgers and African wild dogs. It covers an area of 1,100 sq. mi. (2,800 sq. km) and is composed of granite ridges, a river valley and swamps. The park is famous for the baobab trees. These trees reach heights 16 to 98 ft. (5 to 30 m) and have trunk diameters of 23 to 36 ft. (7 to 11 m). They do not have distinct growth rings, therefore it’s difficult to judge their age but radiocarbon dating indicates that some are at least 1,275 years old. George and Ashley camped atop a great granite massif. The huts appear very “rustic’ from the outside but proved to have very nicely appointed interiors, including comfortable beds and a great view. A short drive the following day took them to Bashay Rift Lodge. Built on top of a hill, it offers a breathtaking 360 degree view over the Ngorongoro walls and Rift Valley. 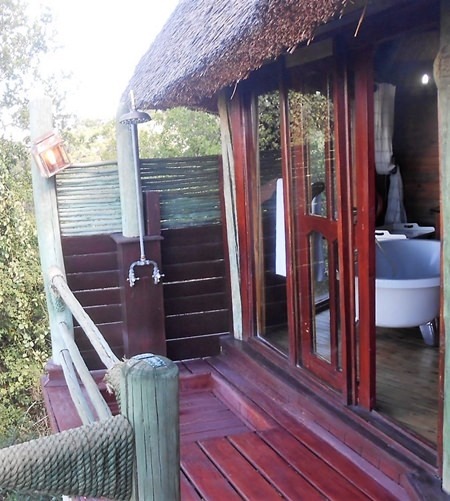 The lodge has 26 rooms, a swimming pool and services that included mountain biking, guided walks and massages. They met members of the Hadzabe tribe, learning their ancestral way of life and spent time hunting birds with them. George Wilson had an interesting story about this outside shower at one of his lodging places. He was told to watch for any monkeys that might appear and if seen, to go outside and turn the water off. It seems the monkeys who enjoyed a good shower would turn the water on, but were not very conservative minded as they never turned the water off. An entire day was spent exploring the Ngorongoro Conservation Area, as well as a game drive in the Ndutu plains. As opposed to traditional national parks, villages are allowed in the conservation areas and time was made to learn about their way of life. The main feature is the Ngorongoro Crater, the world’s largest inactive, intact and unfilled volcanic caldera. The crater, which formed when a large volcano exploded and collapsed on itself two to three million years ago, is 2,000 feet deep (610 meters) and its floor covers 100 sq. miles (260 square kilometers). 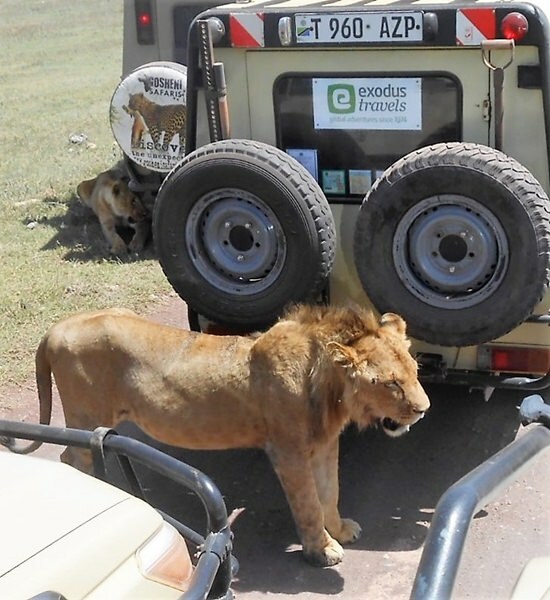 A 2-day game-drive found the group in the Serengeti National Park. This is Tanzania’s oldest national park and remains the flagship of the country’s tourist industry. Its name means “the place where the land runs on forever”. The park covers 5,700 Sq. miles (14,750 sq., kilometers) and includes grassland plains and woodland forests. It lies in the northeastern part of Tanzania bordered to the north by Kenya. This park offers the biggest concentration of cheetahs, lions, leopards and other big cats in the world. George Wilson said one of the great things about his trip was viewing the animals, such as this lion roaming free in its natural habitat, rather than caged in some zoo. George and Ashley stayed in a semi-permanent camp in the heart of the national park. The camp provided large comfortable tents, with beds and linen, showers and toilets in each tent. During the evening, they enjoyed group gatherings around the campfire and spent time in the bar and mess tent, illuminated by gas lanterns. Their final days were spent in the Grumeti Hills Camp which provides a 360 degree view of the Serengeti planes and the Grumeti River. The camp is 100% solar powered and has 24-hour electricity and hot water. The dining area is a spacious, thatched roof building that includes a lobby and a bar that opens onto a large terrace with views over the massive plains. A large swimming pool is carved into the rocks. Sixteen individual tents include a bedroom, dressing room alcove, bathroom, basin and shower. A walking safari and night game drive were also provided. The final morning included a game-drive, taking them to the very small Kili Airport where they boarded a 14-seat Caravan, twin-turbo aircraft, for a scenic flight back to the Kilimanjaro Airport. They flew over the Serengeti Plains, the crater chain and the Rift Valley. To view the complete presentation, visit https://www.facebook.com/pcecclub.org?ref=profile and select links for “Program for June 18, 2017 George Wilson Africa 15 days” (Parts A, B, and C). After the presentation, MC Roy Albiston brought everyone up to date on upcoming events. This was followed by the “Open Forum” portion of the meeting where questions are asked and answered and comments made about expat living in Thailand.